Lot 196. 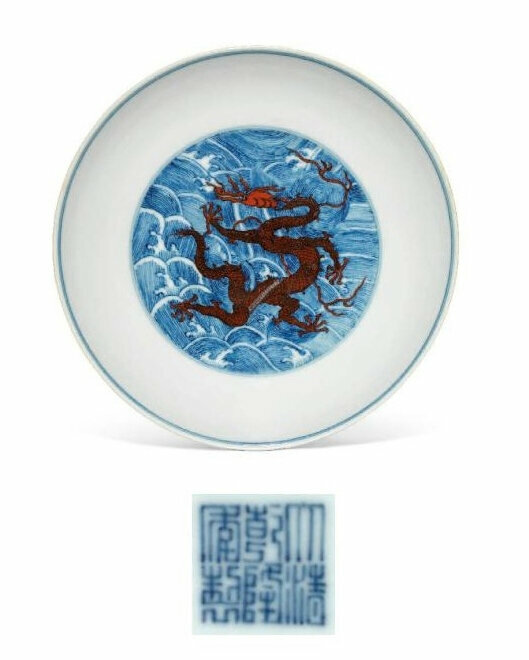 A blue and white 'Red Cliff' brush bot, bitong, Kangxi period (1662-1722), Wen zhang shan dou mark in underglaze blue; 7 ¼ in. (18.5 cm.) diam. Estimate GBP 20,000 - GBP 30,000. Price realised GBP 50,000. © Christie's Images Ltd 2018. 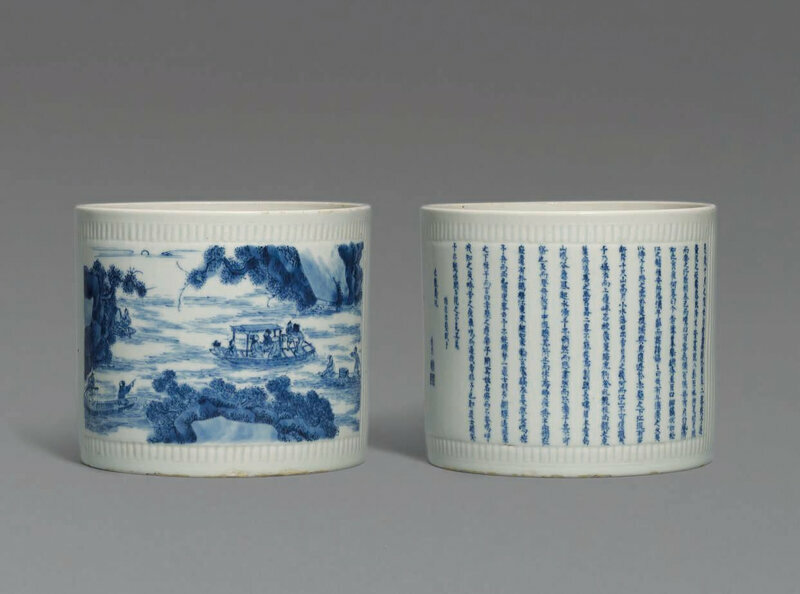 The brush pot is decorated with two panels, one depicting a scene from the Latter Ode to the Red Cliff with the scholars on the river in the moonlight. The other panel is inscribed with an excerpt from the text, entitled, and signed 'Hua Long Zhai wan', and Qiao Yin (lumberjack recluse) with two seals. The two panels are reserved on a ground ofanhua incised vertical lines. Note: The four-character commendation mark can be translated as "Scholarship high as the mountain and the Great Bear". 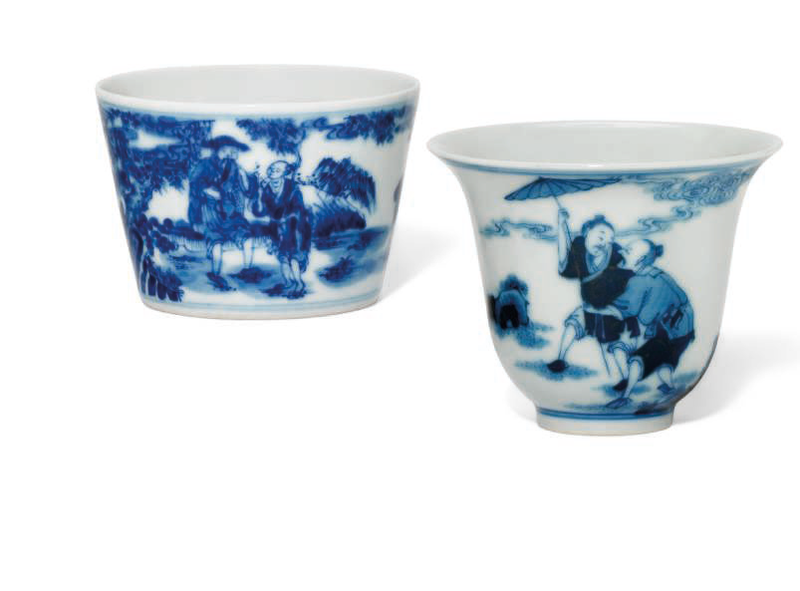 Two further blue and white 'Ode to the Red Cliff' subject brush pots with the same mark were sold at Sotheby's Hong Kong, 21 March 2018, lot 524, and at Christie's New York, 22 March 2007, lot 324.